United sure did a number on its award chart early last year, but there are still a few opportunities to save on redemptions. Today, TPG Contributor Richard Kerr digs into the rules and routings to find hidden value in a significantly devalued MileagePlus program. Sometimes I find myself harkening back to 2012. These were the days prior to any real program devaluations hitting the street and causing me to change my earning and redemption strategies. In late 2013, United announced it would be increasing the price of award ticket redemptions significantly, especially when booking seats in premium cabins on Star Alliance and other partner airlines. However, there still are some great sweet spots and strategies lingering in United’s program. Today, I’ll show you why you shouldn’t lose all hope when checking your MileagePlus balance. Flying from the USA to New Zealand will cost you 40,000 miles one-way in economy. Flying from the USA to Fiji via New Zealand will cost you only 35,000 miles one-way. Add a flight and get a discount. San Francisco to Auckland costs 40,000 miles one-way. Add a flight to Fiji and get a 5,000-mile discount. My favorite use of the Oceania region is flying from my current home here in Japan. Japan to New Zealand/Australia will cost 22,500 miles one-way in economy. Japan to New Zealand to Fiji will cost only 12,500 miles one-way in economy or 30,000 miles one-way in business. Last year, my wife and I flew Air New Zealand from Tokyo-Narita to Auckland and then to Fiji. Round-trip it cost us 120,000 miles. That was almost 25 hours of business-class flying for only 60,000 miles each! Oceania also includes the Cook Islands, French Polynesia, Guam and some other much-desired destinations. Europe covers Iceland to Russia, starting at only 30,000 miles round-trip including one stopover and two open jaws. 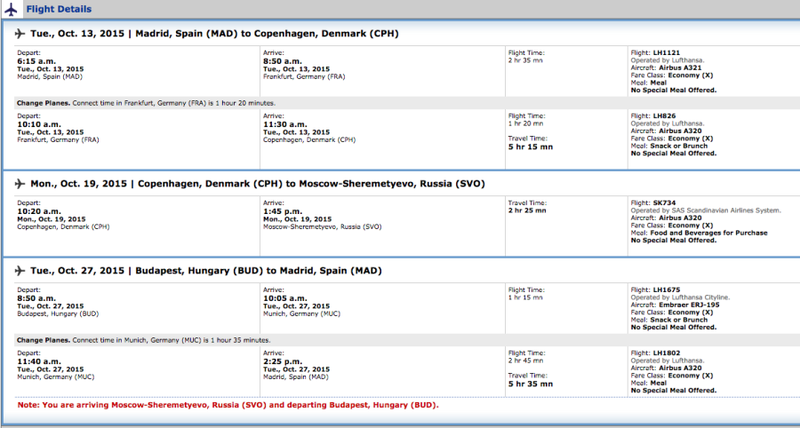 This means you could see an itinerary including Madrid, Copenhagen, Moscow and Budapest for 30,000 miles. This beats programs such as British Airways’ Avios, which charges per segment and can have high carrier-imposed surcharges. Maximize the itinerary even more with a second open jaw. Like the Oceania concept, traveling in a non-direct method can sometimes yield you a lower mileage cost. Washington, D.C., to Dubai one-way costs 42,500 miles. 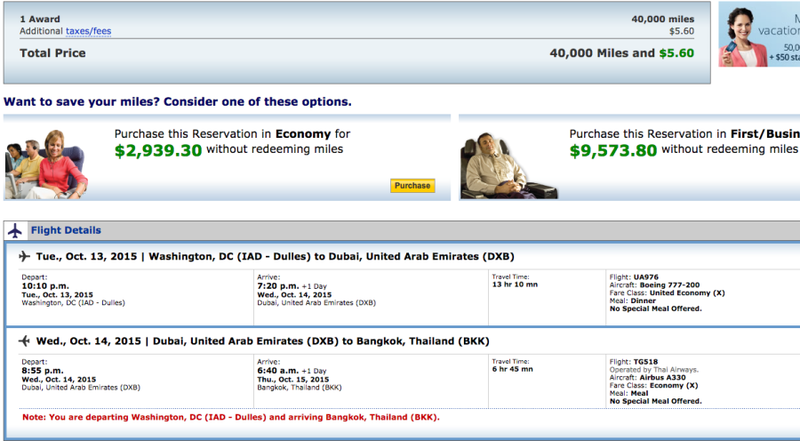 Washington to Dubai to Bangkok costs 40,000 miles one-way. You can do a lot more reading and research on which zones outweigh others, and therefore get a cheaper price IF you can combine them. 42,500 miles from Dulles to Dubai. Combining Southeast Asia with the Middle East will make a flight to the Middle East cheaper. This is where maximizing United redemptions becomes more of an art form than a science. You need to practice routings, craft unusual city pairs and build your experience in getting United.com to work. I do everything I can to book itineraries online and avoid phone agents telling me my itinerary is invalid. I never limit a round-trip United booking from Region A to Region B round-trip. You can often include a region C for no extra miles. These itineraries can start from all over the world. South and Central Africa to Central Asia costs 60,000 miles round-trip in economy. South and Central Africa to Central Asia to Europe and back to Africa costs the same 60,000 miles round-trip. 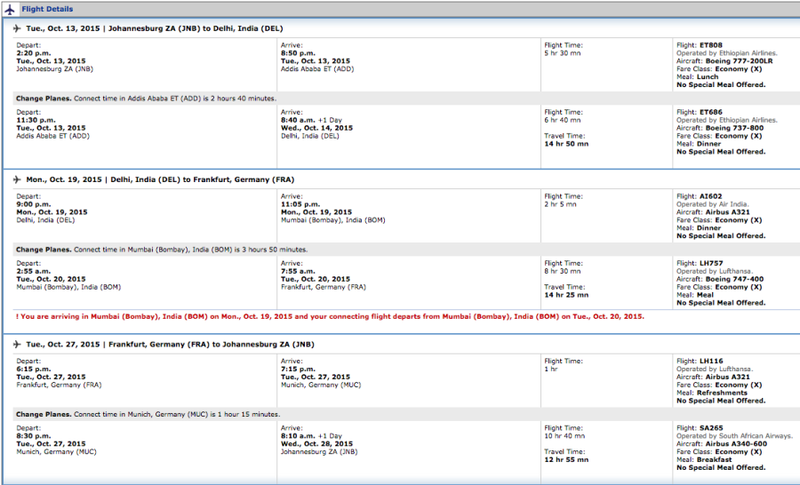 Adding a return with a stopover in Europe does not increase the price of a South Africa – Central Asia trip. It still costs 60,000 miles. 35,000 miles will get you round-trip from the US to Central America. 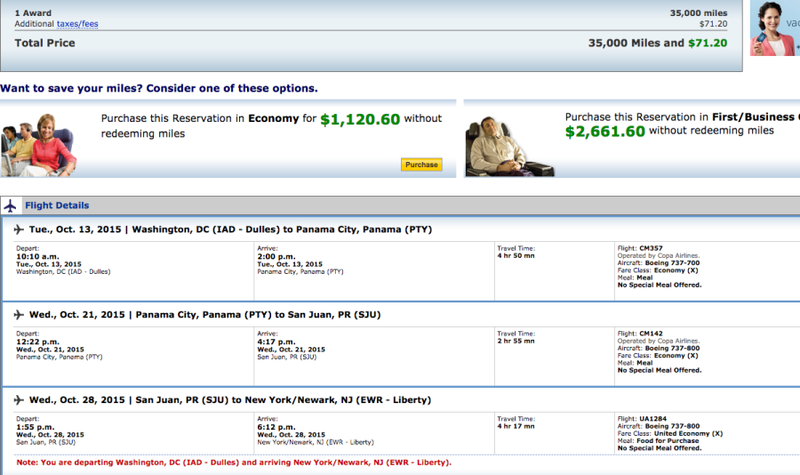 It is the same price from the US to the Caribbean round-trip. Using Panama-based Copa airlines, it is possible to visit both Central America and the Caribbean for 35,000 miles. Continuing the trend of tightening award routing rules, this is not as easy as it was just 6 months ago. Recent banter on message boards reflects how difficult it is to do this now, but it is still possible. Visit Panama and the Caribbean for 35,000 miles round-trip. The real trick is figuring how to visit two Caribbean islands on this one itinerary. You would stop over at one island and make Panama City your layover/turnaround point en route to your second island, which would be the destination. This is yet another example of including a third region on your round trip redemptions. The key to making sweet spots in the United award chart even sweeter is maximizing the one stopover and two open jaws allowed. When traveling internationally, I always try to add on a free one-way in the form of an open jaw. If I have not used my stopover, I will stop over in my origin and plan a trip at a later date, which will have the first leg free. United’s rules and ticketing system are not as generous as they once were. Previously, there wasn’t an enforced segment limit on itineraries. Now, depending on where you are traveling, you may be limited to four segments to reach your destination. That includes getting to and from any stopover you are trying to make. These days, practice makes perfect when looking to make the most of your MileagePlus balance. Have you found any other sweet spots in United’s Award chart? Let us know in the comments.